We didn’t eat a lot of vegetables when I was a girl growing up in Ohio. My dad didn’t think it was a meal unless there was a big plate of bread on the table and my mom didn’t consider it a meal unless there were potatoes. Our vegetables ran along the lines of grey-green canned peas or spinach, with an occasional celebratory head of iceberg lettuce. Still, I grew into healthy adulthood – and a love affair with fresh vegetables. I tasted my first artichoke when I was about 16. We had moved to California and I had a babysitting job for “some rich people” who introduced me to that most wondrous vegetable! I love them every way they can be prepared – so you can imagine my anticipation when I walk in our garden and see four strong beautiful artichoke plants! My friend, Kathy, who gave me a couple of the plants, tells me that once they start producing I’ll have more artichokes than I know what to do with. I hope so. I said I like them any way they can be cooked, and that’s true, but when John and I were first married we had dinner at his parents’ house and his mom introduced me to the very best artichoke recipe in the world. There is quite a bit of prep-work, so I don’t make them real often, but they are worth the trouble. Hands-down, Stuffed Artichokes are the Paladini Family Favourite! Combine 1 cup seasoned bread crumbs with 1/2 cup dry parmesan cheese. Add about 1/2 cup hot chicken bullion and a little olive oil. Set aside. Wash four large artichokes, work at spreading out the leaves. With a sharp-edged spoon (like a grapefruit spoon), reach in and scoop out the center thistle fuzz. Wash them well again to remove any fuss that clings to the artichoke. Depending on the effort you want to put into the project, you can cut the pointed tip off each leaf with a pair of kitchen shears. I used to do this all the time, but I’ve discovered it is not really necessary. They still look pretty, and taste just as good. With your fingers place a small amount of bread crumb filling between each section (leaf) of the artichokes. Place a plate or low steaming rack in a heavy Dutch oven and stand the artichokes on it. Add about 2 inches of water – just till the water reaches the bottom of the artichokes. *You will want to make sure the water does not go dry and you will probably have to add boiling water during cooking. Drizzle olive oil on each artichoke and steam them for about 45 minutes. Serve the artichokes in individual bowls with olive oil, providing an empty bowl for leaves. Artichokes can also be cooled and cut in wedges to serve as an appetizer or antipasto. Mmm my favorite. We bought a pressure cooker, just for making stuffed artichokes. We also drop a few peeled cloves of garlic (and the artichoke stems) into the bottom of the pressure cooker. Most are edible. Some stems are better than others. Everything is infused with the Garlic flavor. Thanks for reminding us of a great Family favorite! Love the clove of garlic idea! Thanks Ray! 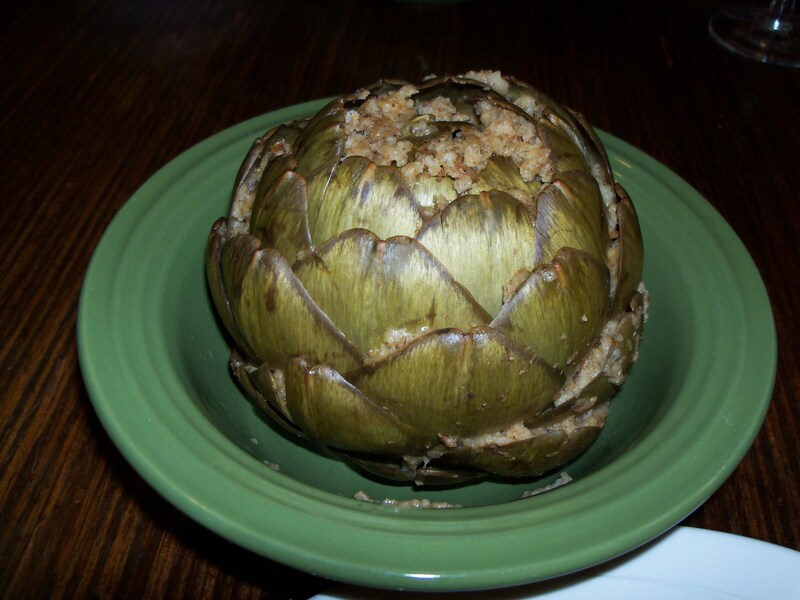 I’ve had many artichokes in my life, but they never compare to Mom’s stuffed artichokes! MMMMMMM. Thanks for the delicious memory. Now I know what is for dinner next week. We’re going to Monterey this weekend. I’ll be sure to pick up the artichokes on our way home. All the other ingredients I have!